I wrote in a previous note about the wonderful day Lea and I spent at the Heartland Industries’ various locations with Danny & Kathy, and posted a short video and information about the unique milking carousel they use to process 4,000 milking cows every day. While it was a very impressive operation to experience first hand, they have another line of business that I didn’t appreciate quite as much until after the visit was over, and I tasted their product. It is the Heartland Creamery. Located in northeast Missouri, amid fields of corn and soy beans, the Heartland farm land is home to over 6,000 Holstein dairy cows and 750 milking goats. These herds produce naturally fresh, creamy milk, which is bottled or made into cheese just down the road from the dairy at the Creamery, which milks about 250 goats twice a day to produce bottled goat milk. While it may not sound that appealing initially, I was surprised at the full rich flavor of the milk. I was even more pleased when I learned that the profits from Heartland Creamery are used to sponsor faith-based work with troubled adolescents and adults in the varied Heartland businesses, which give the participants the opportunity to experience a variety of trades. Heartland Creamery believes that customers deserve the pleasure of drinking truly fresh, wholesome milk, and their bottling plant uses glass bottles to preserve the natural fresh flavor in the milk. Sometimes milk that is bottled in plastic absorbs a slight plastic flavor. More delicate types of milk, such as goat’s milk, are especially susceptible to flavor absorption and must be carefully handled. Although Heartland Creamery promotes old-fashioned service, the processing and bottling are all state-of-the-art, right down to the way they wash the glass bottles. The bottle washing machine has a maximum capacity of 300 of the thick-walled glass bottles at a time. The bottles are completely submerged into a cleaning solution, then power washed, rinsed with fresh water, sanitized and sent to the bottle filler for fresh, creamy milk. Most folks agree that milk tastes better in glass, and in Heartland’s service area in the midwest, their products can be found at most retail outlets. The classic, old fashioned, glass milk bottles are favorites where ever you go. I can verify for you that their products are delicious. Lea and I each drank a chocolate milk, purchased at the dairy, and Danny and I each purchased a quart of the Goat Milk for consumption later. After dinner at the Lodge, we returned home to chill the Goat Milk until the bottles were frosty cold. 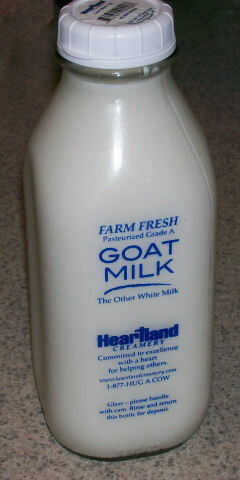 If you haven’t tried goat milk, you need to know that it tastes very much like half milk and half cream. It is very pleasant, and has no unpleasant flavor at all. When we took the chilled bottles of goat milk from the refrigerator, and drank directly from the glass bottle, it was a wonderfully tasteful experience! I had always heard that most people prefer milk from a glass container, and I can now say that I have joined their ranks. Drinking from the glass bottles reminded Lea and me of drinking milk from the small half-pint glass bottles with cardboard lids during gradeschool lunches many years ago. As I recall, those bottles of milk cost us five cents. And, now, after all this time, we rediscovered a delightful pleasure from the past, and were very pleased to relive those memories. It was a very enjoyable experience for all of us, and I hope you have the same opportunity one day soon. Goat’s milk is a new favorite for me! You may find it pleasing to your palate as well.